I have been wanting to make one of these, but I didn’t have a lathe. Then I found an old Buffalo lathe at a yard sale for $85 including tools. I jumped at it. So this is my first lathe project. I didn’t actually use any of the plan templates themselves. 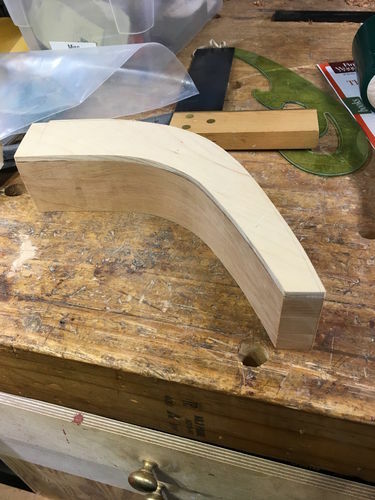 I made a story stick for the spindle, designed the curve of the legs myself with a french curve. The only thing I’d made on a lathe before this was some custom size dowels for my last project. I used a Fine Woodworking plan that I found really helpful, especially since I had no idea how to use the lathe to get that shape. Made it much, much easier. Made from Cherry. It is finished with sprayed super blonde shellac with Renaissance wax on the top. My mortise dovetails were a little rough. I’d like to do that part again just to get them a bit better fit. Other than that, I have got this piece out of my system. FYI: I don’t think you had to go that deep on the dovetails. They look a little deeper than necessary. But you did a nice job. FYI: I don t think you had to go that deep on the dovetails. They look a little deeper than necessary. You may be right. That was the depth the plan called for. Charles, this is a beautiful piece and is so nicely done. It looks like an original. Hey, Charles, nice write-up, and it was really fun watching this come along on FB. And I feel you on the dovetails: when I made mine, that’s the part I wished I could have gotten cleaner, too. Overall, I really like the look of this stand. Most of the ones I’ve seen have higher profile legs (i.e., taller and narrower), so it’s nice to see something different. Also, kudos on doing such a nice, straight taper on the spindle. I used curves in mine simply because I knew I couldn’t turn something that straight and consistent if my life depended on it! Also, using a smaller circular support underneath the table looks great, and I’m assuming this design choice was afforded by the nice wide boards you used for the top. 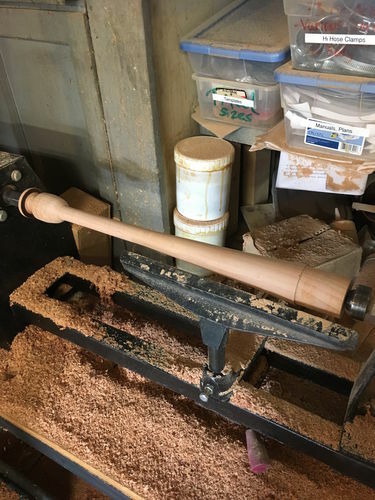 So how’d you enjoy your first lathe project? Good job, Charles … looks great! Overall, I really like the look of this stand. Most of the ones I ve seen have higher profile legs (i.e., taller and narrower), so it s nice to see something different. Also, kudos on doing such a nice, straight taper on the spindle. I used curves in mine simply because I knew I couldn t turn something that straight and consistent if my life depended on it! So how d you enjoy your first lathe project? Although I used the parting tool incorrectly at first, the idea of using it to establish the diameters every inch all the way down the spindle really helped. Then it was just making a smooth transition between the low points. I’m not sure how I would have done it on my own, but this method works great. 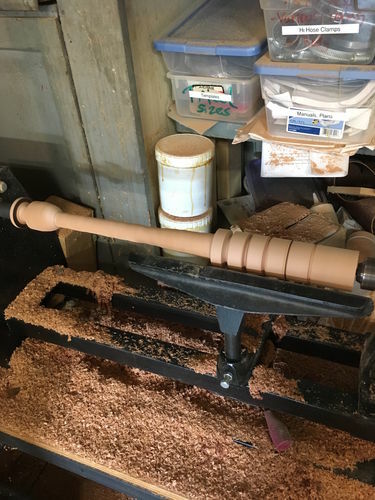 I think this project confirmed what my instinct told me: I want to have a lathe so I can use it in projects, but I’m never going to be someone who turns as the major part of my woodworking. I have a plan for a Shaker candle stand in a NYWS book and I’m thinking that I too am going to need to do it… just because it’s there. I have made a few pieces with this type of dovetail-joined legs. It is indeed a challenge. There is always at least one dovetail slot where the grain fights you. The good news is that every time it gets easier and the results improve.